The tomato is a sprawling plant in the nightshade family widely cultivated for its edible fruit. 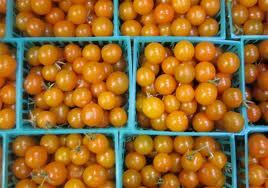 Savory in flavor (and accordingly termed a vegetable), the fruit of most varieties ripens to a distinctive red color. 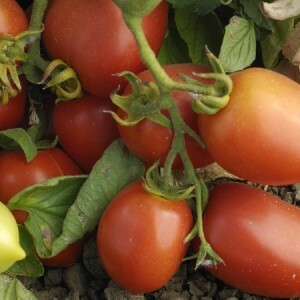 There are many different varieties of tomato plants and most produce red fruit, but there are also tomato plants that produce yellow, orange, pink, purple, green and white fruit. Tomato plants also vary in size from small cherry tomatoes to elongated plum tomatoes. Tomatoes are high in Vitamin A and C and are naturally low in calories. They are also an excellent source of lycopene, which is the pigment that makes tomatoes red and has been linked to the prevention of many types of cancer. Short-Term Storage: Store fresh ripe tomatoes in a cool, dark place, stem-side down, and use within a few days. Tomatoes taste best if not refrigerated; refrigerate only if you can’t use them before they spoil. Freezing Tomatoes: If you choose to leave the skins on your tomatoes, there are two ways you can freeze the fresh, washed tomatoes. • One: Blanch the tomatoes in boiling water for one minute, and then submerge them in cold water (placing ice into the water will make this process go a little faster). Leave the tomatoes whole, or cut them into quarters or halves and place them into suitable containers (freezer-grade plastic bags, rigid plastic containers, glass containers or heavy-duty foil containers). Use within 12 months. • Two: Don't blanch the tomatoes. Leave the tomatoes whole, or cut them into quarters or halves and place them into zippered plastic bags designated for freezing. Use within 12 months. • Boil Water. Start a large pot of water to boil. You will need enough boiling water to pour over your tomatoes later in step 4. • Jars. The perfect way to sterilize your jars is by using your dishwasher on sterilize setting. Leave them in the dishwasher after it finishes so they will remain hot. If you don't have a dishwasher with this setting, scald the jars in boiling water for 5 minutes and leave in a warm oven on lowest setting until ready to use. • Lids and Rings. Boil the lids and rings for about 3 minutes. Turn to low and leave in the pot until ready to use. • Skinning Tomatoes. Place your tomatoes either in the sink or a large plastic tub container that fits in your sink. Pour boiling water enough to cover tomatoes. You only need to leave tomatoes in this water for 1 minute. Immediately rinse them in cold water or move them into a large container filled with very cold water. • Removing Skins. Remov the skins and cores and any tough green parts. This should be very easy and the skins should come right off. After removing skins, cut the tomatoes in medium pieces and throw them in your big cooking pot. • Cook Tomatoes. Bring your pot of tomatoes to a boil. Keep them at a light boil for 30 minutes, removing the scum that forms on top that looks like pink foam. This is easiest with a large metal spoon. • Fill the Jars. Put 1 teaspoon of salt in each jar. Use a funnel that fits on the jar top and is as wide as the jar opening. Using a ladle, fill each jar not quite to the top, but leaving at least 1/4 inch of space. Place your lid and ring on and tighten the ring. • Cool Jars. Place your filled jars on a table or countertop upside down so the heat from the tomatoes will seal the lids. You only need to leave upside down for about 20 minutes. The lids will pop when they are correctly sealed. Store until ready for use. 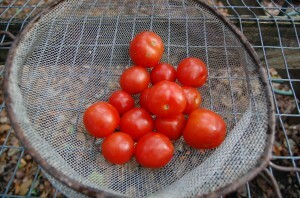 • Thoroughly clean tomatoes by washing them under cold running water. 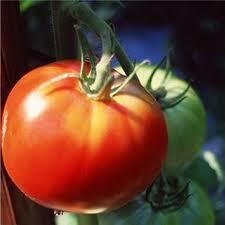 • Do not stack tomatoes; the extra weight can bruise or disfigure the bottom tomatoes. • Exposing tomatoes to direct sunlight during storage can prevent thorough ripening. Tomatoes can be refrigerated for use at a later time but should be served at room temperature for optimum flavor. • Tomatoes are often served sliced or chopped into sandwiches, hamburgers, salads, salsas, stews and omelets. Tomatoes can be made into pasta or pizza sauce. They can also be broiled, baked or stuffed. The following nutrition information is for 1 medium size tomato (148 grams).